The Electron Machine Corporation developed the first in-line process refractometer more than 50 years ago when orange juice was first concentrated. Since that time, our refractometers have been successfully applied on many more applications. 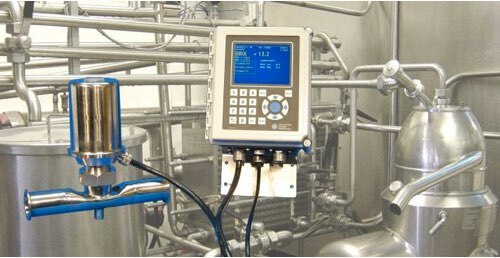 Our latest in-line process refractometer, the MPR E-Scan, has many features that make it very well suited to all types of industrial food processes. With an extremely durable Sapphire prism as its foundation, the MPR E-Scan combines accurate measurements with rugged components in the sensing head. This combination produces the essential dependability required for years of use in harsh industrial environments. Where required, all installation options are designed and manufactured to appropriate 3-A Sanitary Standards.